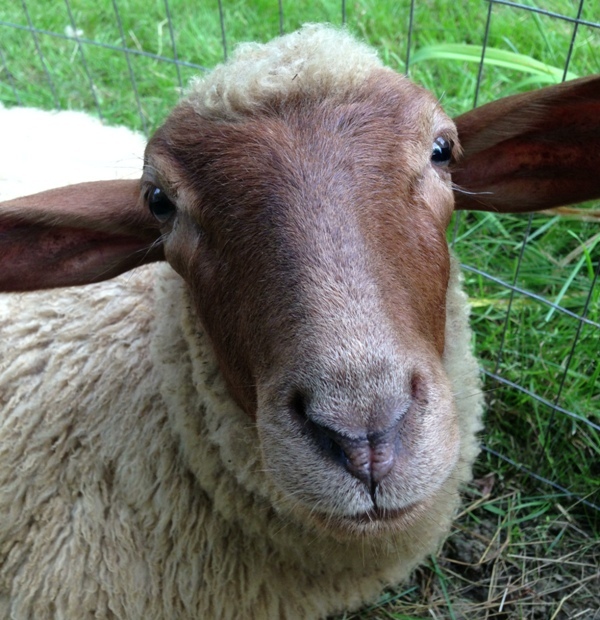 Since getting into animal rescue, and in particular starting an organization that rescues farmed animals, I have become fascinated and inspired by the many vegans who see the plight of farmed animals and open their homes to–or create homes for–the cows, pigs, sheep, goats, chickens, turkeys, and other animals dumped into the “food animal” and “livestock” bucket. Even by vegans, these animals are often seen as “other” when it comes to consideration as companions. 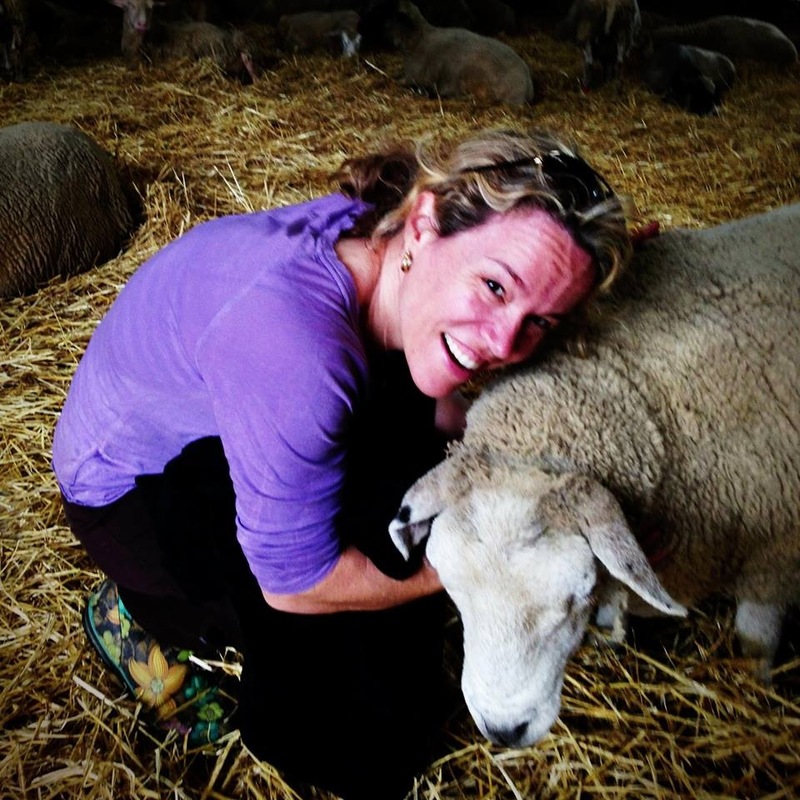 Amy Dye is someone who has seen the realities of animal agriculture and has changed her life accordingly–by becoming vegan and by rescuing farmed animals. Not only does she and her family have some awe-inspiring garden spaces thriving on their one-acre property in Maine; she also went beyond the fairly entrenched ideas (even amongst vegans) that “companion animals” are exclusively dogs, cats, and occasionally other small furry creatures, and that veganism is a diet. When I was a child, my family raised chickens and turkeys for food. I vividly remember anticipating their arrival each spring. The mailman would pull into the driveway and beep the horn, presenting a small, brown box with 50 peeping chicks. Out came the camera, documenting their first steps in the outside world on our basement carpet. 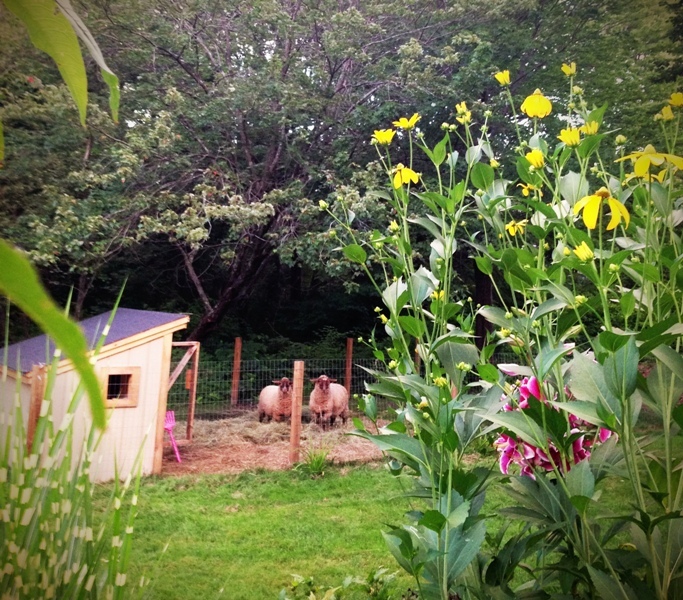 All summer long we would feed them our leftover sandwich crusts through the fence of their outside coop. They hung out with us in the yard, keeping our dogs and me company on warm summer days. Inevitably, the dreaded day would come that my stepfather would slaughter each one in the side yard, leaving a circular, fly-covered bloodstain for the remainder of the fall. Their heads were left in the compost, tiny eyes closed. I would shut my shades and hide in my room on these horrible days, feeling very different from the rest of my family, who happily dunked the dead chicken or turkey bodies in boiling water and then hung them upside down to pluck. Even though I was extremely upset that the birds were killed each year, I did not realize that I did not have to eat them. I ate all animal products, just like everyone else, without giving it a second thought. I had never heard of vegetarianism, much less veganism, until much later. As I grew up, I became a dog rescuer, focusing on dachshunds, only because Ziggy the dachshund was the first one I rescued from our local shelter. Pippin and Winston came next. Pip was a breeding dog from a puppy-mill raid in Tennessee, and Winston was left behind when his owners were evicted from their home, also in Tennessee. With age came a husband and human babies and declining health for the “furkids.” I lost the last of the dachshunds, Ziggy, who was fittingly also the first, two years ago. My husband and I became very interested in gardening and being more self-sustainable around this time. We had always enjoyed having a garden, but when we moved to a new house with more land and sun, he especially embraced vegetable gardening. We had discussed getting some goats for milking, and even visited a few farms. The woman at the first farm pointed out a skinny Nubian cross goat and informed me that she was going into the freezer soon if she couldn’t figure out what was wrong with her. I asked her how they killed the goats, and she told me that they take them behind the barn and shoot them in the head. She laughed when I suggested putting them to sleep, as the vet bills were more than they could afford. The barn was lined with angora rabbits in cages. In the distance, over a small hill, were white turkeys, undoubtedly the same breed as the ones from my childhood, waiting for the weekend to be slaughtered for the Thanksgiving holiday. The woman at the next farm told the same story (shooting in the head, which ones would be in the freezer, etc.). While we were there, one of the females went into heat and she let a male go in to mate with her. “She’s a virgin, so she doesn’t know what to do,” she said, as the male chased her around the enclosure. In doing my research about the goats, I read a story about a woman who was doing what we had intended to do, raise them for milk. I had never thought about the fact that they had to stay pregnant most of the time in order to produce. The baby goats were not allowed to nurse and then were sold to whoever wanted them. The woman in the story recounted a time when one of the kid goats was sold to a family and put into the trunk of their car to be slaughtered for Easter dinner. That was her aha moment and mine as well. After these experiences I decided to not pursue the goat idea. Still not “getting it,” I decided that I would like to get some ducks instead, since we have a brook that runs behind our house, and we could use their eggs. I ordered four ducks–two Khaki Campbells and two Cayugas–from an online poultry clearinghouse. Just like the chickens and turkeys, the ducklings came in a tiny box. I found out a few days beforehand that they were coming from California . . . I live in Maine. Even though I was worried about the ducklings when I knew they were in the mail, I still didn’t make the connection that what I was supporting was wrong. I figured that since this is the way it is done, it must be OK. I later found out about how inhumane the practices at hatcheries are–that they kill most of the male birds, because they are not considered valuable because they don’t lay eggs. I began having conversations with friends that I could easily be vegan, but I was afraid of how it would affect my family. My husband and I had several favorite dishes that we liked to make together, and honestly, I was scared that I would cause disruption in the family. In the fall of 2012, I saw the movie Forks Over Knives sitting on the shelf at the video store. Although my reasons for being vegan weren’t health-related, as a Registered Dietitian, the topic interested me, and I thought my husband would enjoy it as well. After it was over, he said, “I’m in! I will do a plant-based diet for a month.” That was all I needed to hear. I’ve been vegan ever since. I became involved very quickly in animal rights activities and began looking for more “farm” animals to rescue. We only have about an acre of land, so it couldn’t be cows, and our town doesn’t allow pigs, so they were out. I had goats in the back of my mind and began looking through Farm Sanctuary’s animal adoption network. I saw an ad from Christine Egidio, mentioning that she was an ex-sheep farmer, newly vegan, looking to re-home some of her girls. I immediately e-mailed her to inquire. Two months later, I drove to Danbury, Connecticut, to meet Christine halfway to collect my two new friends, Violet and Clover. The first question people ask when they hear I have sheep is, “Are you going to shear them and use the wool?” I tell them that yes, you have to shear them because we have domesticated them so that their wool would continue to grow and get matted and attract disease and cause extreme discomfort. They also want to know what I will do with the wool. It’s hard for them to accept that I am going to leave it outside for the squirrels and birds to make nests out of. Here in Maine, as I’m sure is true in other parts of the world, it is very “cool” to spin yarn and knit your own hats, sweaters, etc. What people don’t realize is that by and large, “wool sheep” are not allowed to live long lives. Once they are done producing nice wool, they are sent to slaughter, just like any other “farm” animal. They are commodities. The girls themselves are similar to dogs in temperament, I would say. However, they don’t get as depressed as dogs, I have found, being left alone. When I scratch their necks they shake their legs just as dogs do and they are always thrilled to be in your presence when you are around. They have distinct personalities, even though they are twins (fraternal)–Clover is more of the bossy diva, and sweet Violet is a laid-back love bug. I would say to any vegan considering rescuing a farm animal to go for it. I built the sheep enclosure myself with a post hole digger. On days when I don’t spend much time with them, they are content to be by themselves. It doesn’t take much time at all to make a world of difference for these special souls. I work and have two small children, and I have done it. You can too! We also only have an acre of land with a LOT of gardens and play equipment for the kids–you just need to be efficient with your space. I think of the millions of sheep and lambs slaughtered and/or mistreated every day as I look in their eyes. Each and every animal is special and unique and deserves to live their lives. Until the world is vegan, we need to give refuge to the ones who make it out alive. Stories of awakening and transformation like this are always so inspiring, and I found Amy’s to be especially beautiful! Thank you for sharing it – delighted to have discovered your wonderful blog! Thanks for your comments, Laloofah! Amy’s story is inspiring to say the least. It is my dream to help animals, I hope I can do that someday.. Those sheep girls are lucky to have you to give them a good life.